All wind turbine projects in Ontario should be put on hold until results of a federal health study are known, says Lambton-Kent-Middlesex MP Bev Shipley. Shipley told The Chatham Daily News Friday he has received complaints from residents in the Mitchell’s Bay area in Chatham-Kent concerning the large number of turbines being erected in what appears to be record time. The MP said he isn’t surprised by the lack of support both he and MPP Monte McNaughton have received from the McGuinty government. But he is surprised by the relative silence of major environmental organizations for their failure to speak up in calling for a moratorium. 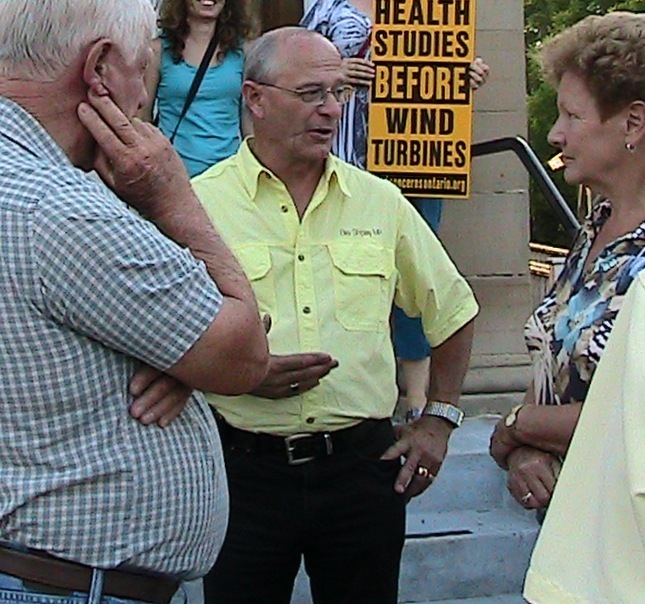 Shipley said he appreciates wind turbine development in Ontario is a provincial matter, but is convinced construction should halt until the results of the federal health study are tabled. He said there is currently not a scientific consensus to conclude whether there is a relationship between exposure to wind turbine noise and harm to human health. But he said that is what the federal health study may be able to determine. He said if there is a link between human health and noise from wind turbines, there is a need to protect citizens before the province compounds the problem by moving ahead with additional projects. “I’ve been out to the Mitchell’s Bay area to see first hand the turbine construction that is taking place and to talk with residents who are concerned about their ground water supply,” he said. Shipley said wind turbines are driving a wedge not only between rural and urban residents but also between a growing number of rural residents. Former Dover resident Jules Roy of Toronto, who owns a waterfowl hunting marsh near Mitchell’s Bay, is concerned about the damage the wind turbines will do to waterfowl flight patterns as well as to waterfowl themselves. He said he’s amazed the province would allow the construction of dozens of turbines along the Lake St. Clair-Mitchell’s Bay shoreline, regarded as one of the major North American north-south flyways for migrating waterfowl. Roy said he’s convinced the turbines will also cause property values to decline, pointing to a recent study by a London land appraiser supporting his claim. Posted on October 15, 2012, in Bev Shipley, Canadian Government, Environment, Health. Bookmark the permalink. Leave a comment.